alaTest has collected and analyzed 820 reviews of Lenovo IdeaPad A1 / Lenovo IdeaPad Tablet A1. The average rating for this product is 3.8/5, compared to an average rating of 4.5/5 for other products in the same category for all reviews. Views about the design and durability are on the whole positive. The performance and usability also get good feedback, but opinions about the apps and storage are mixed. There are some less positive views about the camera and screen. We analyzed user and expert ratings, product age and more factors. Compared to other products in the same category the Lenovo IdeaPad A1 / Lenovo IdeaPad Tablet A1 is awarded an overall alaScore™ of 86/100 = Very good quality. The tablet market is quickly dividing into two camps: those competing against the iPad on the high end, and budget-minded products that compete with the Amazon Kindle Fire . The Lenovo IdeaPad A1 includes front and rear cameras, Bluetooth, memory expansion, and a full-fledged Android experience, at a great price. The screen has a bad viewing angle, the design is chunky, and the Android OS isn't the latest and greatest. 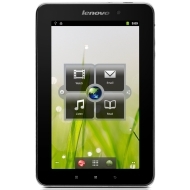 The Lenovo A1 is a classic Android tablet, at an attractive price, but its subpar screen gives the competition an edge. Lenovo IdeaPad A1 is a 7-inch (1024x600 pixels) tablet running Android 2.3 Gingerbread. In addition, it also comes with Wi-Fi connectivity support, 3-megapixel camera, GPS, 16GB of built-in memory and a microSD slot. The Lenovo IdeaPad A1’s $199 price point makes it an exceptional value. It has specifications that while not mind-blowing, get the job done. A well-rounded tablet for the price. The Lenovo IdeaPad A1 has everything you could need from a slate, including a decent screen, GPS, Bluetooth, and a front and back facing camera.... It's a fully-functional, ultra-portable, and very affordable tablet. The Lenovo IdeaPad A1 tablet has just come in for review and we are going to be putting it through the paces over the next week or so.